Access to pharmaceuticals is a critical component of a properly functioning health care system. The reality that some Canadians have difficulty paying for their medications, combined with unqualified claims regarding Canada’s approach towards drug coverage compared to its international peers has led to a perception that governments in Canada do not currently help Canadians— particularly vulnerable populations—pay for their prescription medications. Given the increasing importance and prominence of this public policy issue, an accurate understanding of existing provincial programs is critical. First and perhaps most critically, a review of provincial drug plans finds extensive coverage for lower-income Canadians. Provinces, of course, differ with regards to their approach towards both general coverage and shared costs as well as how to support vulnerable groups like lower-income Canadians. For example, British Columbia’s Fair PharmaCare plan, the province’s main drug coverage program, covers 70 percent of the cost of eligible prescription drugs for families with a net income less than $15,000. Once a family has spent approximately 2 percent of their net income on drugs or related costs, the province pays for 100 percent of any subsequent costs for the rest of the year. The province offers coverage to families with higher incomes but requires them to first pay out-of-pocket for their drug costs (up to 2–3 percent of their income) before any provincial coverage kicks in. In Alberta, families (with children) earning less than $39,250 can access the province’s Non-Group coverage plan by paying a monthly premium of $82.60. Prescription drugs covered under the program are subject to a 30 percent co-payment up to a maximum of $25 per prescription. Higher-income families in Alberta can also access this program but with higher pre­miums. Lower-income Alberta families as well as a number of additional covered circumstances such as pregnancy, high ongoing prescription needs, and disability are exempted from premiums and any co-payments for many prescription drugs as well as some over-the-counter products. For example, a single parent with one child in Alberta with income less than approximately $26,000 would be exempt from the premium and co-pays under the Adult Health Benefit. Quebec broadly has one of the more unique approaches to pharmaceutical coverage in Canada. It requires residents not covered by private group insurance to enroll in the government’s drug insurance plan (RAMQ). Participating individuals are required to pay premiums that range from $0 to $616 per year, depending on family income. Individuals must pay the first $19.90 of their drug costs out of pocket, after which they only pay 34.9 percent of the cost of eligible drugs up to a monthly maximum of $90.58 (after which all costs are covered). However, the premiums along with the deductibles and co-pays are waived for a host of different groups including Quebecers on social assistance, children under 18, full-time students, and persons with a functional impairment. Ontario has three main programs to support its residents and their access to pharmaceuticals. The Ontario Drug Benefit Plan covers residents over the age of 65 plus those living in long-term care or special care homes, Ontarians on social assistance, and those with disabilities. Depending on income levels and circumstances, this program requires Ontarians to pay very low amounts upfront (ranging from $0–$100) before coverage begins, after which only small copayments (ranging from $2.00–$6.11) are required. This program was recently extended through the introduction of OHIP+ Children and Youth Pharmacare to cover youths under the age of 24—at no charge—who are not currently cov­ered by private plans. Ontario also maintains the Trillium Drug Plan, which covers non-senior adults and those not generally covered by the other two pro­grams. The costs of the program vary by household type and income. More generally, lower-income Canadians have access to at least some form of provincial insurance that helps limit out-of-pocket costs for prescription drugs to a small percentage of income, if not more extensive coverage, in every Canadian province. It’s worthwhile also noting that recipients of social assistance have coverage at very low or even zero cost in every province. 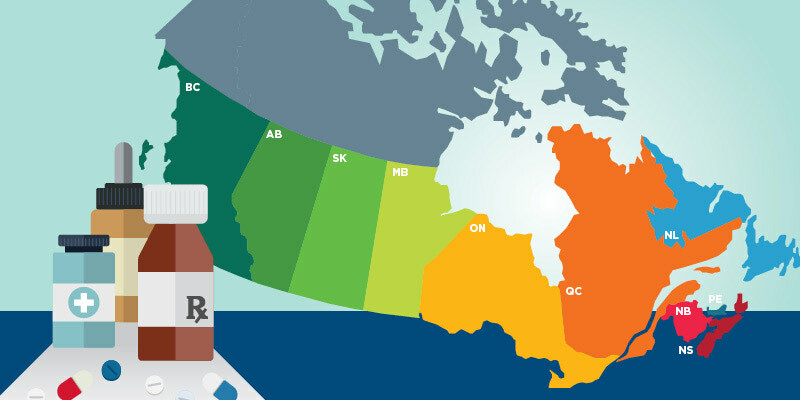 Provincial governments across Canada also provide drug coverage to select populations who may face considerable hardships as a result of either their medical care costs or other factors including the severely disabled and those diagnosed with conditions like multiple sclerosis and cystic fibrosis. The review also finds that every province maintains a drug coverage program for seniors. While there are differences in the income thresholds for accessing public coverage, coverage for seniors tends to be relatively more generous than for non-senior adults without children. The importance of prescription medicines paired with concerns about their affordability for those stricken with illness form the basis of many calls for a national pharmacare plan. Lacking in the debate is a clear understanding of the coverage that is already available to those subsets of the Canadian population who may be at higher risk of foregoing their prescriptions due to cost—i.e., those with lower incomes (including seniors), the disabled, and patients with chronic medical conditions.